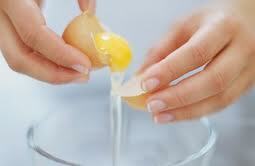 I found this simple at home spa treatment and you should’t have to buy anything unless you are out of eggs!! Beat you egg white then smooth the beaten egg white all over you face, let it rest for half an hour, and then rinse with water. Thats all!! This mask will refresh and tighten your oily skin adn will make it look much healthier than before. Use in the winter to help create a natural barrier to protect you skin from the harsh winds! Homemade Hair and Nail treatments! I enjoy reading your home made things. I got so many things I want to try.